The students continue to work with the team at the Alhambra Theatre in workshops to develop their critical eye and have fun creating their own artistic work, with plenty of opportunity to celebrate their achievements at the end of each year. 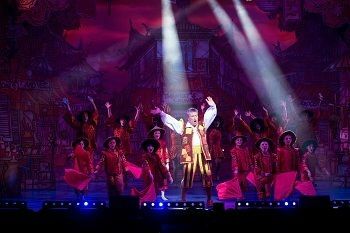 The next school visits are linked to the Alhambra Theatre’s lavish pantomime, Aladdin, which is an ideal genre as a first introduction to theatre, with its relaxed atmosphere and opportunity to join in. The Alhambra Theatre’s name is synonymous with pantomime. Francis Laidler, who built the Alhambra Theatre over 100 years ago, was known as the King of Panto and for half a century, he delivered panto after panto in his Bradford venues, as well as venues in Leeds, Keighley, Manchester, Bristol and London. The three local education establishments which will be participating in pantomime-themed activities and bringing students to see the panto at the Alhambra Theatre are Hill Top CE Primary School, Southmere Primary Academy and Bradford College (English for Speakers of Other Languages). The students will participate in workshops led by Julia O’Keeffe, Learning Coordinator for Bradford Theatres; these workshops include a storytelling exercise to explore the story of Aladdin; acting improvisation around characters; and some choreography to The Greatest Show song. “From the perspective of an ESOL teacher of 16-18 year old learners, I am trying to facilitate not only language learning, but also enable my students to integrate into a new society and culture. Last year my students had the opportunity to experience what they described as ‘the joy of British culture’ when we went to see the pantomime Cinderella at the Alhambra Theatre as part of the Start Project. Magic and humour transcended the barriers of language and ethnicity and afforded my learners an escape from the stresses that swamp them and gave them memories to treasure. One learner said ‘I don’t just wish to see this once again; I wish that I could see it every day of my life so that magic and laughter can fill me continually’. Start, created by Children & the Arts, is a three-year engagement programme of arts activity between selected cultural organisations and local schools that tackles inequality by working only with the children who need it most, who are at risk of missing out on a creative and cultural education. The Start programme raises the aspirations of young people, builds confidence and helps with learning and development in school. It also provides teachers with training for them to deliver the arts programme, helping pupils realise their full potential and making links to the curriculum.